After all my big talk about Easter plans and ideas, I thought I would report back with how we actually celebrated this year. On Thursday, Reed & I attended a super-cute play group party. We started with a craft: "Thumb bunny loves me" magnets. 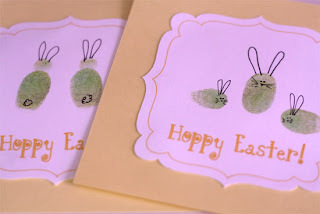 Using some bright paint on Reed's thumb, we made two small prints in the shape of a "bunny" on a simple piece of paper. Add some ears, an eye, and a white cotton-tail and voila! Oops! I left Reed's craft on Thursday, so this image is a stand-in... same basic idea for the bunnies though. Next, we fixed "rabbit sandwiches" for a lunch/snack. Um, so cute! We ended with a quick Easter egg hunt... Reed's first ever! Before going outside, Luanne (hostess) told a really cute story about a little bunny who lived in Gethsemane Garden and witnessed the burial and Resurrection of Jesus. It was an interesting way to lead into the egg hunt, as she tied some events in the story concerning a basket and a fallen egg to reminders (for the bunny and now for us) that Jesus rose from the dead. So she told all of the kids that whenever they see their baskets and eggs to remember, like the bunny in the Garden, that Jesus is Alive! On Saturday, we visited with my family. (We sure missed the Altizers!) We shared a delicious Easter meal, and my Mom prepared an egg hunt fit for an army of toddlers... but for two crawlers. Reed and his cousin Cameron surprised us all and were very adept at egg hunting! Also, apparently we have trained Reed well; he gathered all of the eggs that contained cash. Boo-yah! Sundays are busy mornings for us (about to get busier- more on that to come), so we started the morning with a hug for a PJ-clad Reed, and plopped him down near his Easter basket. Can you please just take a look at his cute face as he swept the living room and spotted it? I ended up using a beach bucket for Reed's basket (someone remind me to buy a basket on sale this week! ), since he's making his first ever visit to the beach next month! The bucket and sand tools are from Reed's Gram (thanks, Mom!). The foam cards with words and pictures are for the bath, and let me just tell you- he LOVES them. Reed is learning new words every week, so I saw these at Target and decided to use them to fill his basket. After church on Sunday, we spent the rest of the day with our Morgan family-- more cousins, grandparents, and fun. We had an absolutely gorgeous weekend here in Atlanta, with temperatures in the 80's. Mimi even busted out a rocket sprinkler that provided entertainment for kids and adults alike for a good part of the afternoon. :) Unfortunately, I don't have any pics, but you're sure to find some here in the next couple of days. I just got really excited to discover you have a blog . . . Glad you guys had a good Easter :-) love you! Yay- i just started it. We still on for lunch Thursday? I will call you. That face is awesome! What a great age for these sort of celebrations! Cam was still a bit unsure about Easter and all the egg hunts- I can't wait until next year when it makes more sense to him! ;-) And the crafts? So adorable. Great idea! Oh, and Cam has 2 children's Bibles already- but I am not in love with either of them. I'll have to check this one out- thanks!